Our peaceful homes are being invaded by talking Bluetooth speakers and there’s nothing you can do about it—so you might as well enlist the help of these AI-powered hubs and get them to do your bidding. 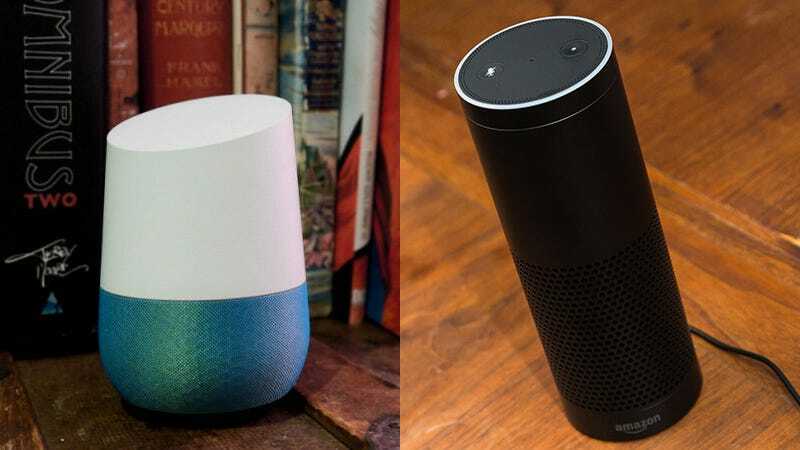 Here’s how to set up your own custom voice commands on Google Home or the Amazon Echo. The easiest option, which works best for most users, is to enlist the help of our old friend IFTTT (If This Then That), which has introduced channels for both Google Assistant and Amazon Alexa, the bots powering the Home and Echo respectively. If you want to get more involved you can do, and we’ll cover some more advanced options further down the page. For the uninitiated, IFTTT lets you connect certain services and apps with other services and apps, through the power of applets. Each applet has a trigger and an action, and that means you can connect all kinds of functions to your Amazon Echo or Google Home. Take a look at the Assistant and Alexa channels to see some of the applets made by Google and Amazon themselves. Turn on your Philips Hue lights, turn on your TV, post to Facebook, find your phone, and so on and so on. When you’re ready to build your own applet—assuming you’ve registered for and signed into IFTTT—open the drop-down menu to the right and choose New Applet. Choose Google Assistant or Amazon Alexa as the trigger, and you’re then prompted to connect IFTTT to your own personal accounts. For Google Assistant, your triggers can be a simple phrase, or a phrase with a key word or a key number. That lets you, for example, specify a contact name or a certain figure you want to dial into your Nest thermostat. With Amazon Alexa, you can set up your own phrase as a trigger, but it’s not quite as flexible as the Assistant channel yet. You can however use a shopping list action, like an item being added, as one of your triggers. When you’ve set up the “if this” part of your applet, you can then move on to the “then that” bit, and thanks to IFTTT’s broad channel support, there’s plenty to choose from. Your newly created voice command can interact with the likes of Facebook, Evernote, Google Drive, Strava, and a ton of wearables and smart home gadgets. There’s a lot of choice but here’s just one idea. Set up a voice command on your Google Home or Amazon Echo that sends an SMS from your Android phone, wherever it is. IFTTT is simple and straightforward to use but if you want to go further with your Echo or Home hacking then you need to put on a developer hat and do some coding. It’s a lot more technical but of course there are many more possibilities. Amazon offers developer tools and step-by-step tutorials for creating your own skills. Here’s one for creating a trivia game that works with Alexa. Google isn’t quite as far down the line with developers as Amazon is, and it uses “actions” instead of “skills”. The Actions on Google platform has just been launched and you can find a wealth of resources and options there.